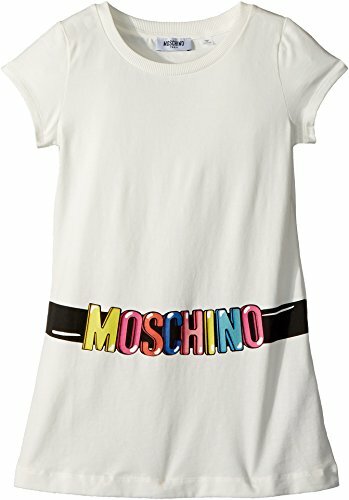 Her style will be effortless in this Moschino Kids® Short Sleeve Tunic. Jewel neck, long-line tee. Relaxed fit with A-line silhouette. Branded, belt graphic print along the waist. Short sleeves. Straight bottom hem. 95% cotton, 5% elastane. Hand wash cold. Made in Italy. This item may ship with an attached security tag. Merchandise returned without the original security tag attached or a damaged tag may not qualify for a refund. Measurements: Length: 24 in Product measurements were taken using size 10 Big Kids. Please note that measurements may vary by size. Her style will be effortless in this Moschino Kids® Short Sleeve Tunic. Branded, belt graphic print along the waist. Short sleeves. Straight bottom hem. 95% cotton, 5% elastane. Hand wash cold. Made in Italy. This item may ship with an attached security tag. Merchandise returned without the original security tag attached or a damaged tag may not qualify for a refund. Measurements: Length: 24 in Product measurements were taken using size 10 Big Kids. Please note that measurements may vary by size. View More In Blouses & Button-Down Shirts. If you have any questions about this product by Moschino Kids, contact us by completing and submitting the form below. If you are looking for a specif part number, please include it with your message.